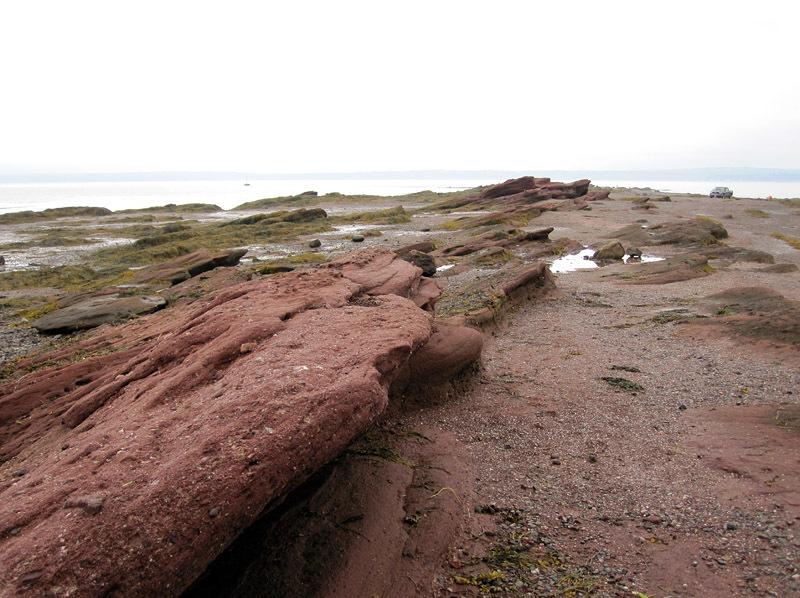 Beds of the Perry Formation in Pottery Cove, Saint Andrews, New Brunswick. Rocks are physical ghosts. If a ghost is a disembodied spirit or a nebulous image of a deceased person, bedrock is a concrete relic of the lost place and time in which it was formed. Geologists and non-geologists, we each interpret rocks in our own way. Those of us who like to collect may get excited about sedimentary rocks as hosts for fossils. The fossils can tell us a lot about past life, but the rocks themselves are packed with information about the places in which those creatures lived. Geologists who know how to read the clues hidden in the ancient sediments can use that information to interpret the rock’s specific facies, a proxy for the environment in which it formed. A sandstone bed in the Perry Formation exhibits a great variety of clast sizes. I find sedimentary rocks particularly striking when they are located in a setting where they superimpose a long-past environment onto a modern one. Sometimes these are surprisingly similar to one another, as described in a previous post. In other instances such as the one shown here, the past and present are remarkably different, yet they exist harmoniously together. At Saint Andrews, we can observe the ghosts of ancient fast-flowing streams as we stroll on the peaceful modern seashore. We each enjoy and interpret the shore in our own way. 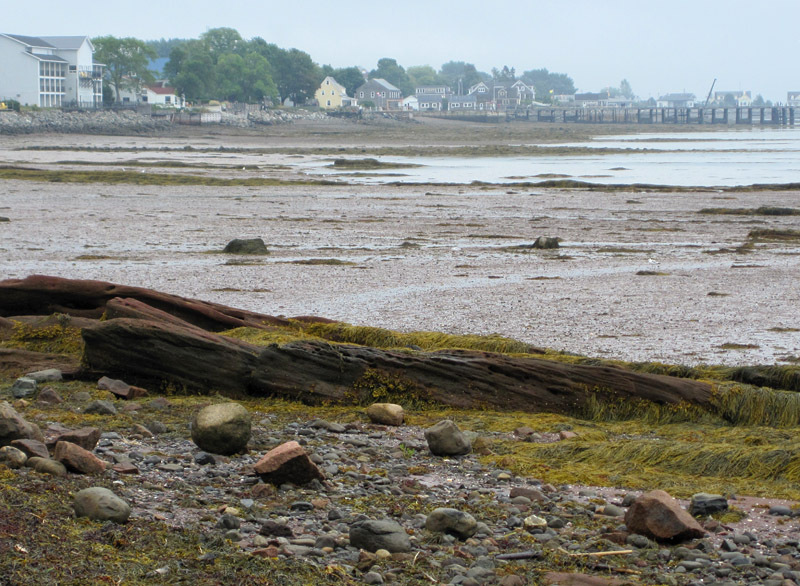 In the Passamaquoddy Bay area, where New Brunswick (Canada) and Maine (USA) meet, a predominant bedrock unit is the Upper Devonian Perry Formation, which is roughly 360-380 million years old. The Perry Formation is unusual because it possesses two very distinct and contrasting personalities. 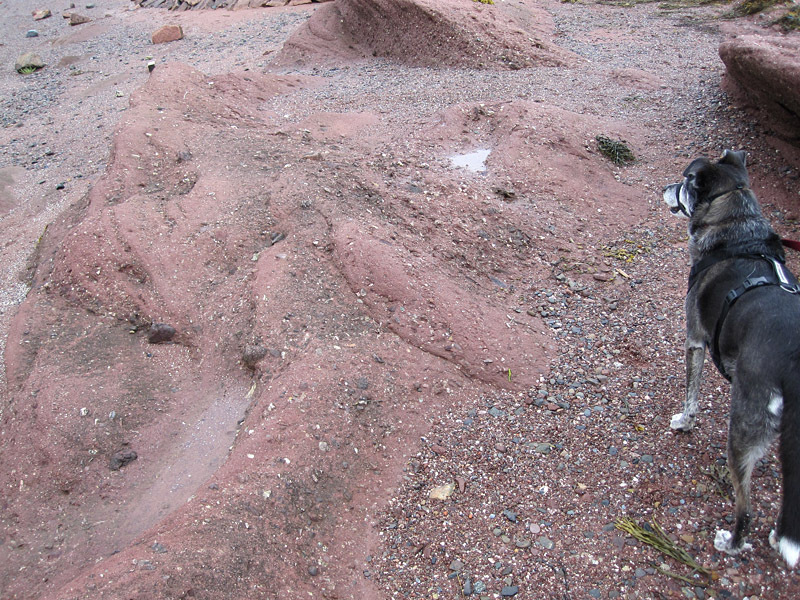 Much of the formation consists of sedimentary rocks: striking red sandstones, siltstones, and conglomerates such as those shown here. Yet the Perry Formation also has a dark side: it includes grey basalts, formed from the cooling of molten lava; I will show some of these in a later post. Cross beds in the Perry Formation demonstrate that the sediment was deposited by flowing water. The modern coast at Saint Andrews is a gentle and civilized setting, with a lushly treed ridge sloping down to a shore where the flow of the St. Croix estuary meets the more open waters of Passamaquoddy Bay. But in the Devonian this was a very different place. The Perry Formation almost lacks fossils (plant fossils are found in a few places), but the story in the rocks tells us about streams and alluvial fans on a valley floor between tall new mountains, which may have still been rising in the mountain-building event that geologists call the Acadian Orogeny. Trough cross beds have curved bounding surfaces and are of limited extent. Geologists have studied features of the Perry Formation, such as the directions of trough cross bedding, channels preserved in the rock, and pebble imbrication (the alignment and overlap of ancient pebbles in the stone). From these studies, they can determine paleocurrent directions, teasing out data from the sandstones, pebbly sandstones, and conglomerates to determine that ancient streams and rivers flowed from north to south out of those long-ago mountains. In some places there are so many large rounded clasts that the rock could probably be called a conglomerate. 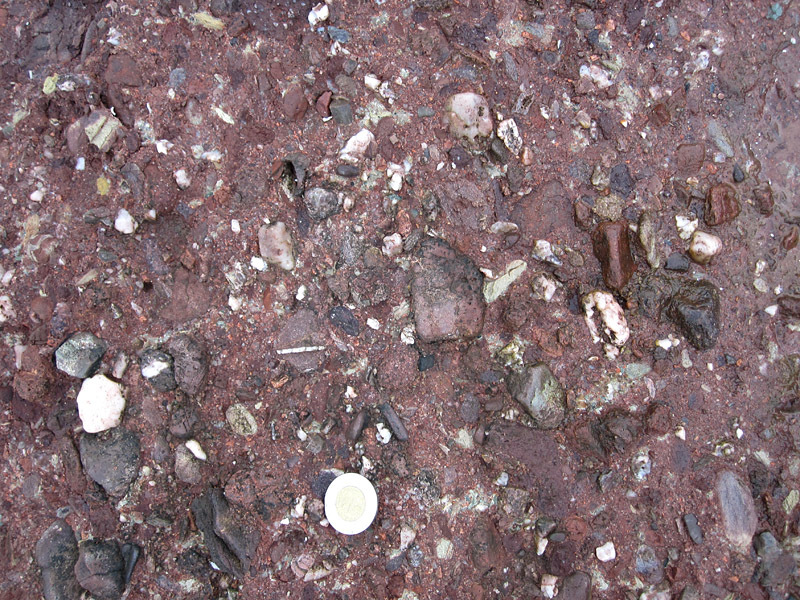 The abundant large rock fragments in the top of this bed indicate that the sediment source was nearby. It makes sense, therefore, that the main source of sediment was to the northwest. The sedimentary rocks become quite coarsely conglomeratic toward the north, and the sediment source was not an immense distance away. 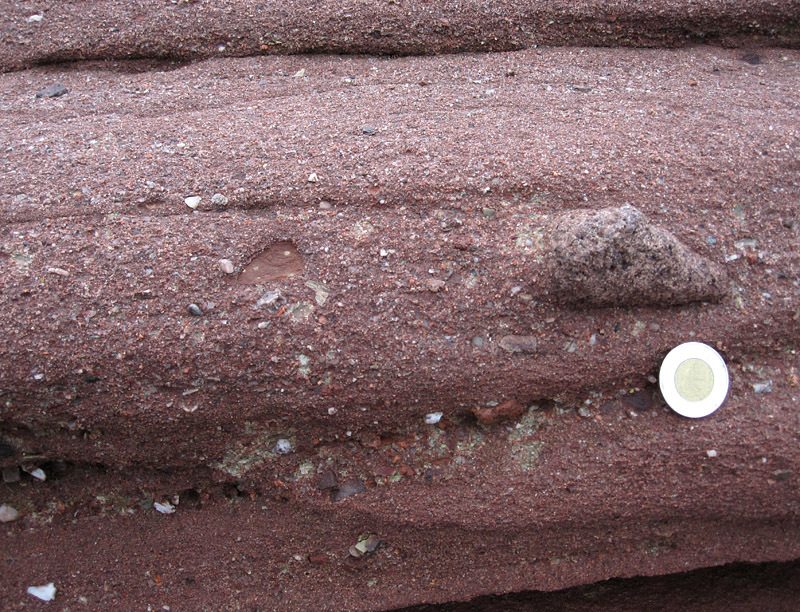 Although there was so much geological activity in the Passamaquoddy area in the Devonian Period, the Perry Formation sediments remain near the original dip angle at which they were laid down, evidence that there has been very little mountain-building around here in the past 350 million years or so! Greiner, H. 1978. Late Devonian facies inter-relationships in bordering areas of the north Atlantic and their palaeogeographic implications. Palaeogeography, Palaeoclimatology, Palaeoecology, 25: 241-263. McIlwaine, W.H. 1967. 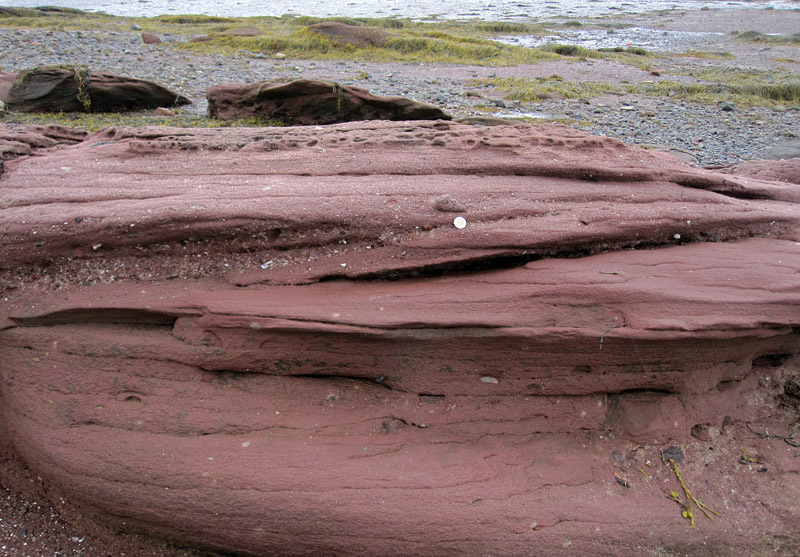 Age and origin of the Perry Formation, Charlotte County, New Brunswick, Canada. Atlantic Geology, 3(2): 56-60. Schluger, P.R. 1973. Stratigraphy and sedimentary environments of the Devonian Perry Formation, New Brunswick, Canada, and Maine, U.S.A. Geological Society of America Bulletin, 84: 2533-2548. Smith, G.O. and D. White. 1905. The geology of the Perry Basin, southeastern Maine. United States Geological Survey Professional Paper No. 35, 107 p.
Stearns, C. and R. Van der Voo. 1987. A paleomagnetic reinvestigation of the Upper Devonian Perry Formation: evidence for Late Paleozoic remagnetization. Earth and Planetary Science Letters, 86: 27-38. Hi Steve, thank you for the comment. 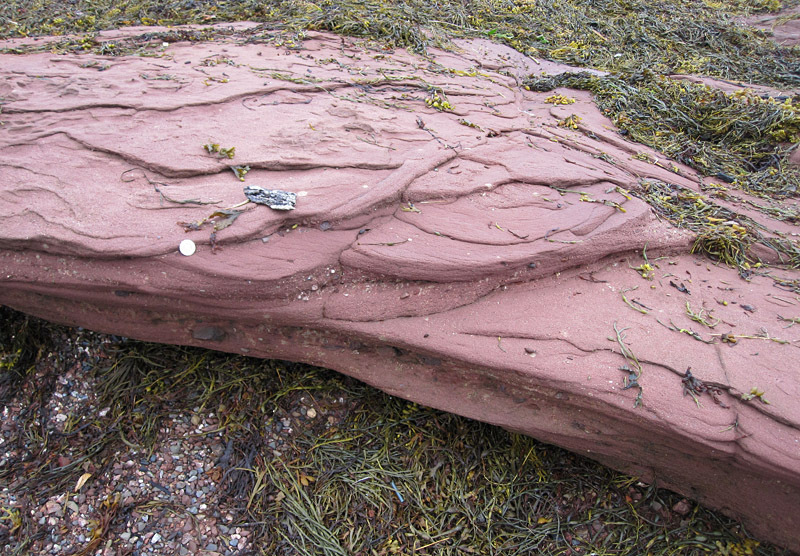 Yes, the red rocks in PEI are somewhat similar sandstones, but the age is actually quite different. These are Late Devonian (about 360-380 million years old), while that in PEI is Permian and up to 100 million years younger! Thanks Graham, My very sketchy knowledge of Canada’s geology is always added to by your expertise!